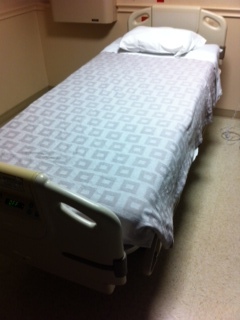 You should change your patient's bed linens often. If they are on bedrest, I usually change them while giving them a bed bath. But wait, won't that mean you'll have to change them while the patient is in the bed? Relax, it's much easier than it sounds. Of course changing bed linens when nobody is in the bed is easy, but changing an occupied bed is a little different but at the same time almost just as easy if you know how. First, if the bed is adjustable, flatten it out all the way. Then raise it up high enough to where you won't hurt your back. Then take the sheet and blanket off the patient and throw them into the dirty linen bin. Depending on the size of the bed and the patient, sometimes you can start changing the bed linens without them even moving. For other patients, you have to wait until they are turned onto their side. Once the patient is on their side, you should undo the old fitted sheet at both ends on the opposite side of where the patient is facing. Then you should tuck the old bed linens as far underneath them as possible without hurting them of course. Then put the clean fitted sheet on the bare corners. Just make sure you don't have it sideways and tuck the rest of it underneath the old fitted sheet. Then grab the incontinence pad and roll it up about halfway on one end. Place it down on the new fitted sheet and tuck it under the old fitted sheet as well. The top should be placed just slightly above the hips while the bottom goes down to the legs. You should aim for it to be placed evenly on both sides of the patient. If needed, now would be the perfect time to put barrier cream on the patient or place an adult diaper against their bottom. After everything is in place, have the patient roll back onto their back and to the other side. Just warn them of the "hump" underneath them from the bed linens. When they are on their side at the opposite end, you should be able to undo the rest of the old fitted sheet and toss it into the dirty linen bin. Then the new fitted sheet should be visible. Grab it and stretch it to the remaining bare corners and unroll the rest of the incontinence pad and/or adult diaper. 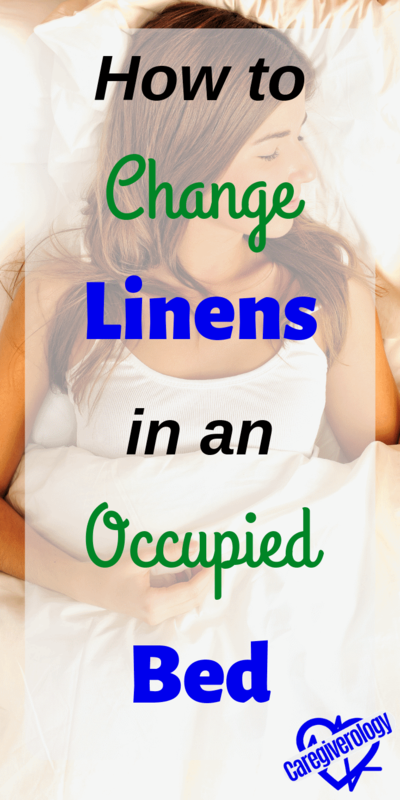 Make sure there are no wrinkles in the fitted sheet or the pad. This will irritate their skin and make them uncomfortable. After that, the patient should be able to roll back onto their back. Then you can grab their pillow or pillows and change their cases. The easiest way to do this is to squeeze the sides of the pillow together with one hand and an open pillowcase with the other. Then just slide the pillow inside. It may take some practice but it's better than using your chin. Then put the pillows back and reposition the patient if needed. Ask the patient if they want just a sheet, or a sheet and blanket to cover up with. If they don't want a blanket, just put it at the foot of the bed or close by in case they get cold later. It's better to unfold them rather than shake and fling them over the patient. It's just better manners and doesn't give off an unwanted breeze. If you are in a hospital or similar facility, then you should of course make sure the patient has their call light. And if the bed is adjustable, make sure you lower the bed back down and adjust it to their liking. Above all else, make sure they are comfortable. 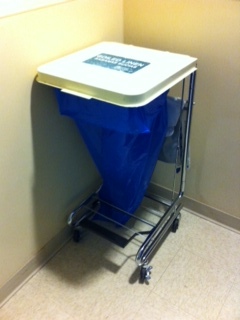 That's it, you have just changed a patient's bed linens without them ever stepping out of the bed. I don't know about you but I was actually pretty shocked at how easy this process was when I first found out about it. With very little practice, it can almost be done without even thinking. It's that simple.